Getting a good start is critical - and here's the best weight lifting program for the job. It’s depressing to spent weeks or even months at the gym with little to show for it. I know. You’ve done research so you can start with what’s probably the best beginning weight lifting program out there. It's compact and hits your whole body. Try it! The important thing with a beginning program is to make it simple and focused. If it's excessively involved you will be inclined to skip you visit to the gym. Also, allow a full 48 hours to recover. If you're just starting your first lifting program your body will recover and get stronger rapidly, but you also won’t know your limits. And since you are new to lifting you risk injury if you increase the weight too fast. Stick to a gradual program with plenty of rest; it's better than enthusiastically burning yourself out in a few weeks. For a the best weight lifting program for beginners you should use big lifts that incorporate a lot of your body. Your body is used to working as a single unit and taking advantage of that teaches your body how to exert strength naturally. Doing lots of bicep curls might look good, but that doesn’t build useful, full-body strength. And to keep track of your progress, you MUST KEEP A TRAINING LOG. A journal or training log is vital to making progress. No joking. If you don’t record the weights you use you are wasting time. Keeping a log will give you positive feedback and show you that you are improving. So, here's the program. It focuses on large, multi-joint exercises to strengthen your whole body. Like I've said before when talking about what strength training is, start out doing these lifts with 3-5 repetitions for 3 sets. 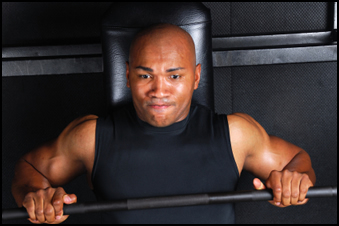 When you can do 5 repetitions easily for 3 sets, increase your weight by 5 pounds. In the beginning you should be able to increase your poundage every other workout. To Download a PDF of the best weight lifting program for beginners, simply right-click here and then click 'Save As'. When doing the Chin Ups, do as many as you can for 3 sets. For the Farmer's Walk, choose the heaviest dumbbells you can carry and walk as far as you can holding them. Then rest, and carry then back to the rack (so, 2 Farmer's Walk carries). Remember, start slow. Injuring yourself with too much enthusiasm in the beginning will NOT help you to build strength. If you are looking to get conditioned for a sport you should think of adding some cardio to your weight lifting program. Keeping you wind as you play will allow you to make much better use of your new-found strength. Now you’ve got a perfect beginning program; start it. Get stronger! • Click HERE to get more information about workout exercises & weight lifting programs! • Click here to leave 'Best Weight Lifting Program for Beginners' & go back to the homepage and get more info about strength training! Rippetoe, Mark, Lon Kilgore, and Glenn Pendlay. 2006. Practical Programming For Strength Training. Wichita Falls, Tex: Aasgaard Co.